Need help? Please review our Frequently Asked Questions. Please find below a list of recommended hotels in order of distance to the Vina Robles Amphitheatre. Hotels marked with an asterisk (*) offer special rates for Vina Robles Signature Wine Club members. Every person over the age of three (3) who attends an event for which tickets are sold must have a valid ticket to gain admission. Pets are not permitted (service animals excluded). Assistive listening devices can be checked-out at the medical booth in front of the Guest Services building in the Main Plaza. An ID is required. 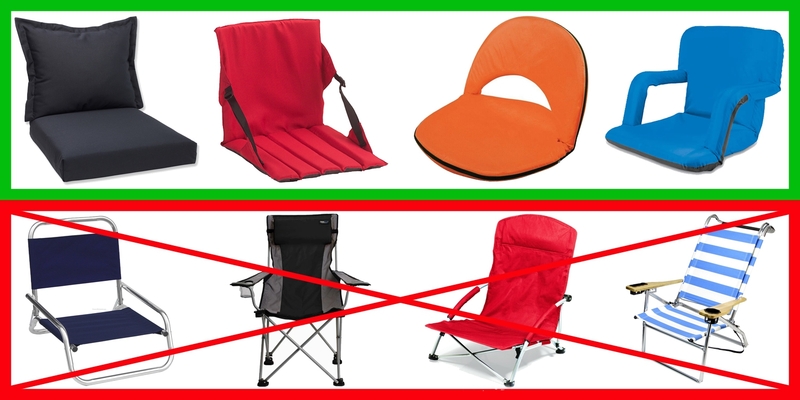 Small blankets and portable stadium-seat-style back supports are permitted on the lawn. Chairs are not allowed as their legs do not function on our sloped lawn. See Lawn Seating below. The Vina Robles Amphitheatre Box Office is open on Thursdays, Fridays and Saturdays from 10:00 a.m. to 6:00 p.m. and on show days from 10:00 a.m. until the end of intermission. Premium Seating options include Luxury Box Suites (seat four ), Jardine Tables (seat four ), and Season Seats (sold in pairs of two ). Premium Seating packages are sold on a per-season basis. A limited supply of Luxury Boxes and Jardine Tables may be available for individual shows. For information on our premium ticket packages please click here. Professional cameras, cameras with detachable lenses, audio or video recording devices, laptops, and tablets are not permitted. Flash photography is not allowed. Please keep all cellphones on silent or vibrate during the performance as a courtesy to other guests. Small personal cameras may be allowed and are subject to artist approval on the day of the show. Please check our website for updates. All children over the age of three (3) must have a ticket. Children under the age of three (3) do not need a ticket but must remain on a parent’s lap throughout the show. Shirts and footwear must be worn at all times. Failure to comply with this policy may result in expulsion from the Vina Robles Amphitheatre. We recommend you dress in layers as Paso Robles evenings may be cool. The Vina Robles Amphitheatre utilizes turf parking surfaces. Comfortable, closed-toe shoes with flat heels are recommended for the best experience walking around the venue. With any concern or complaint based on your Vina Robles Amphitheatre experience, please contact [email protected]. Convenience fees are set by our promoter's ticketing company and include a convenience fee, credit card fees and mailing fees. Costs covered by convenience fees are expenses such as labor, supplies, equipment and system development, as well as maintenance costs. You may purchase tickets at our venue Box Office at significantly lower fees. Click here for hours of operation. Coolers and picnic baskets are not allowed in the venue. Please also refer to food and beverages. Please note there are long merge and acceleration lanes in both directions on Highway 46, allowing you to safely merge with traffic. Mill Road Exit: Long acceleration lanes in both directions help to ensure a safe exit to this divided four lane highway. We are not permitted to install a traffic light or manage traffic at the intersection of Mill Road/Hwy 46. Please wait for cross-traffic to clear and use the acceleration lanes to safely merge onto the highway. Vineyard Exit: (private road - 15 mph) Portions of this road are hard-packed gravel to maintain the natural state of the surrounding vineyards. County approved dust suppressant is used. This exit leads to the traffic light at Golden Hill Rd and Hwy 46, and cuts overall exit time in half. The Vina Robles Amphitheatre is located in the heart of Paso Robles wine country, halfway between Los Angeles and San Francisco. The venue can be conveniently accessed from Highway 46 East, just three (3) miles from both downtown Paso Robles, and Highway 101. 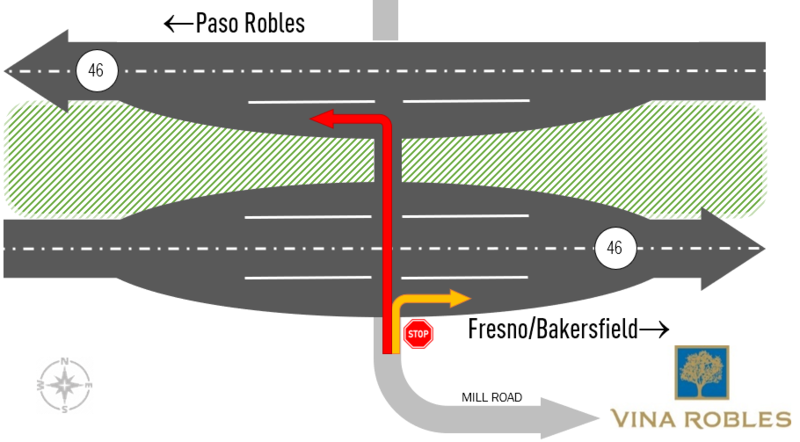 Upon leaving the venue, there are acceleration lanes in both directions on Highway 46, allowing you to safely merge with traffic. For information on employment at the Vina Robles Amphitheatre, please click here. The First Aid station is located at the Box Office building immediately to the right of the Main Gate entrance. Unauthorized solicitation on the grounds or in any of the parking lot areas is prohibited. No outside food or beverages, including alcoholic beverages, are allowed in the venue. Coolers and picnic baskets are also not allowed. Factory sealed water bottles are permitted. All patrons are subject to search and all alcohol will be confiscated. We offer a wide variety of concession items including burgers, sandwiches, wraps, pizzas, appetizers, desserts as well as non-alcoholic beverages. All menu items can be paired with Vina Robles estate wines by the glass or bottle as well as a selection of beer. Click here to view our Concessions Page. Gates normally open one and a half (1.5) hours prior to showtime. For detailed gate open times, please click here. For your convenience, an information table is located at the Guest Services building in the Amphitheatre Main Plaza. ID REQUIRED for all patrons who wish to purchase alcoholic beverages, as required by law. Each patron with a lawn ticket is allowed a limited personal space of two feet, ten inches (2' 10") by two feet, ten inches (2' 10"), or roughly eight square feet (8 sq.ft.). For shows that approach capacity, we ask that lawn patrons kindly accommodate their fellow patrons and respect everyone's need to find a spot on the grass. Please also refer to Blankets & Chairs. The Vina Robles Amphitheatre provides “lost and found” services at the Guest Services building at the venue. After a show, you may contact the lost and found department at [email protected] or 805-286-3680. The Vina Robles Amphitheatre is not responsible for any item that is lost, misplaced or stolen at the Vina Robles Amphitheatre. Items will remain in lost and found for thirty (30) days, then donated to a local charity. All media personnel should contact our Marketing Department for information regarding event coverage. Please visit our media page for more information. There is no parking fee. Parking opens one (1) hour prior to gate opening time. All gate opening and showtimes are subject to change, please check our website prior to your arrival. We recommend carpooling or using a shuttle to all events. 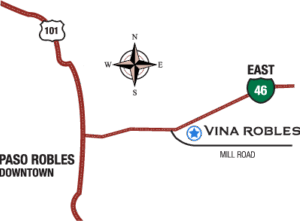 Please note that RVs, mobile homes, trailers, and other over-sized vehicles are prohibited to park at the Vina Robles Amphitheatre. Please scroll up to Departure. Private vending, including the selling of tickets, is prohibited within the Vina Robles Amphitheatre parking lot and grounds. Please click here to view a seating chart. 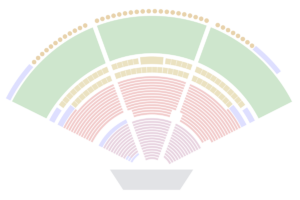 Some shows have a General Admission Pit “GA Pit” in the front. Please note that for these events, this area will be sectioned off with no seats and will be standing room only. The show season typically runs from mid-April through November. Smoking of any kind, including the use of alternative smoking devices (electronic and vapor), is only permitted in the designated smoking areas. For information on sponsorships, please click here. Strollers are not allowed inside the venue. Tailgating is not permitted at the Vina Robles Amphitheatre. This policy is in place for the safety and enjoyment of all guests attending an event at our venue. Tickets can be purchased online, by calling 800-745-3000, at the Vina Robles Amphitheatre Box Office, at Boo Boo Records, or at Traffic Records. There is an eight (8) ticket limit per household unless otherwise noted. When purchasing tickets online, you may either select a specific price level or section. Once you have made your selection, the system will automatically choose the best available seats for you. If you would like to sit in a specific location, row or area you may contact Ticketmaster at 800-745-3000 for assistance. PLEASE NOTE: If you purchase tickets from a non-authorized person or outlet, you risk purchasing a lost, stolen, fake, or overpriced ticket that may not be valid for admittance, regardless of the event. Anyone who purchases tickets from a scalper or ticket broker does so at their own risk. The Vina Robles Amphitheatre is not responsible for replacing or refunding a ticket purchased through a third party broker. The only valid ticket outlets are www.vinaroblesamphitheatre.com, www.Ticketmaster.com, by calling 800-745-3000, in person at Boo Boo Records, Traffic Records, or our venue Box Office. All sales are final, no refunds or exchanges. The Vina Robles Amphitheatre is an outdoor venue. We enjoy a mild climate from about May through October. While summer days can be hot, the evening hours bring cooling breezes from the Pacific. Therefore, bringing a sweater or jacket is recommended. All events are held rain or shine except in the case of severe or potentially damaging weather as may be determined by the venue and artist. In the case of rain, umbrellas will not be permitted. Please check the weather forecast and dress accordingly. 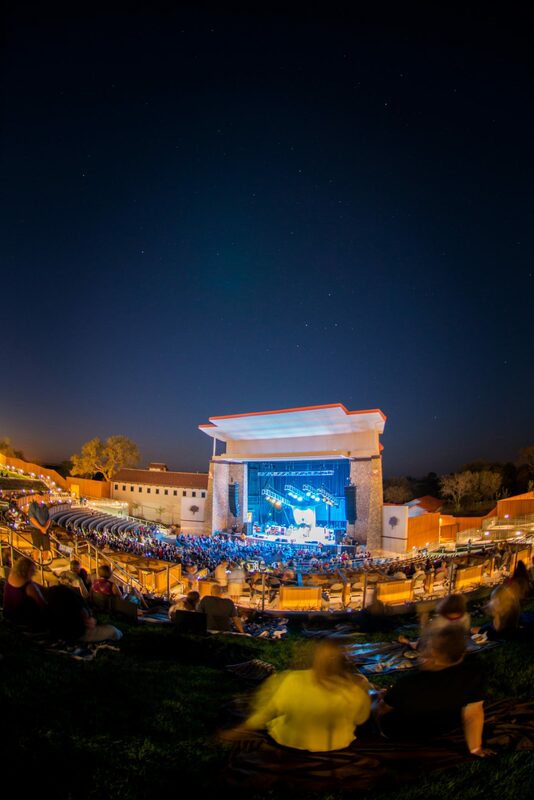 The Vina Robles Amphitheatre has wheelchair accessible seating that can accommodate various height needs so that wheelchair users can see the stage. To purchase tickets for any special needs, please call 800-745-3000 or visit our website. Limited parking is available for any persons with disabilities or those who require additional assistance. 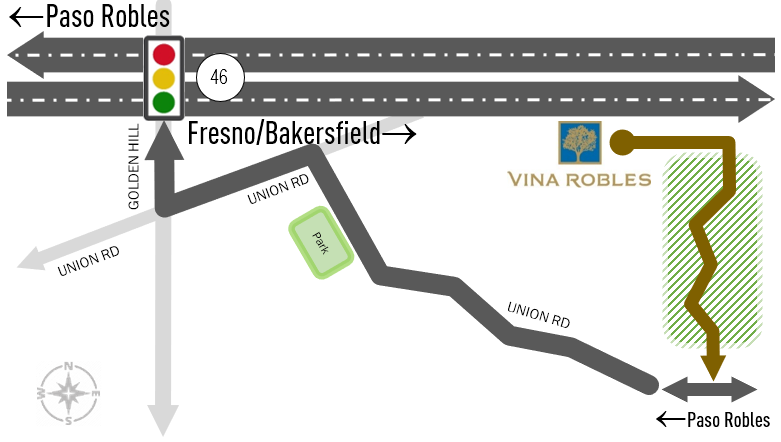 If you need accessible parking, please inform a Vina Robles representative upon entering the gates. Will call tickets can be picked-up two (2) hours prior to showtime on the day of the show. Please look for will call line designation. A photo ID must be shown when picking-up will call tickets. The name on the ID must match the will call name.